2. Feeding of weft yarn is available for one to three colors. But only one color feeding is the standard. 3. 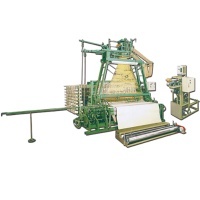 Since the lacquard system is adopted, design of product can be changed by replacing the jacquard card paper. 4. Warp yarn, in a great number of colors, can be freely used. 5. As the mechanism is particularly simple, the machine is very durable & requires very little maintenance. 6. The woven density of weft yarn is adjustable. 7. Both ends (right & left side) of product are automatically cut. 8. The specifications of producers can be changed according to your machines.